What is the mechanism behind Laser Tattoo removal? The laser light of a certain wave length travels through a person’s skin and affects tattoo ink without causing much harm to surrounding tissue. As the laser light is absorbed by the ink, it is instantly converts into heat. Sharp increase in temperature within the affected tissue causes release of the tattoo ink from skin cells into extracellular space. 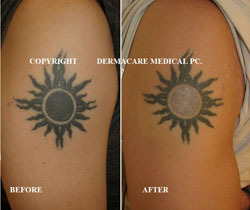 As the result, released tattoo ink is carried away by the lymphatic system while skin cells repair themselves ink free. Since all tattoos are not the same in terms of color, depth of ink deposition as well as their chemical composition, all of tattoos respond differently to laser light. Black, some red and certain shades of dark orange and dark blue tattoos will typically respond relatively better to treatment with laser. However, brown, purple, green, light orange, neon and light blue colors usually is much harder to remove. Unless tattoo ink is very deep in the skin, most tattoos can be successfully treated or dramatically reduced in intensity of their colors if given a sufficient number of treatments. The number of treatments could be 2-3 in case of some homemade tattoos and sometimes up to 20 sessions in some resistant cases of multi colored, multi layered and very saturated tattoos. Although there is a way to predict approximate number of sessions each tattoo may take it is still not an exact science. While the laser light photo selectively affects targeted ink, other part of skin remains mostly unchanged, and therefore most patients report modest soreness. A frequent manner that people portray the feeling of the pulses entering the skin is by comparing them to snaps of a rubber band. If such “snaps” are too painful, Dr. Yagudin may offer you local anesthesia in form of cold air blowing over the treatment area during the treatment or in some cases localized injection of numbing agent called Lidocaine. Instantaneously after laser exposure, the treatment areas may become whitish-colored and swell slightly. This frosting and puffiness tend to go away in about 30 minutes. Over the next several days, some mild crusting may emerge over the treatment area. As this crusting resolves, the tattoo will lighten. The tattoo will normally continue to fade away for many weeks thereafter. Depending on the dimension and place of the tattoo, each session usually can takes between 1 to 30 minutes. 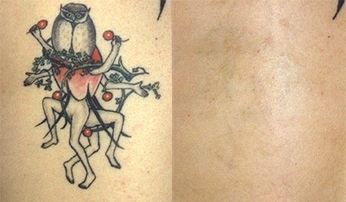 Some pale tattoos will fade entirely after only one treatment, though the majority requires five treatments or more. Treatments should be spaced five to six weeks apart to provide your body enough time to completely eliminate loosened particles of ink. Since the laser beam does not penetrate beyond the skin, major side effects are extremely rare. Mild side effects are redness; swelling, blistering, reduction of color of the skin after tattoo is removed (which typically improves over time once treatments are finished). 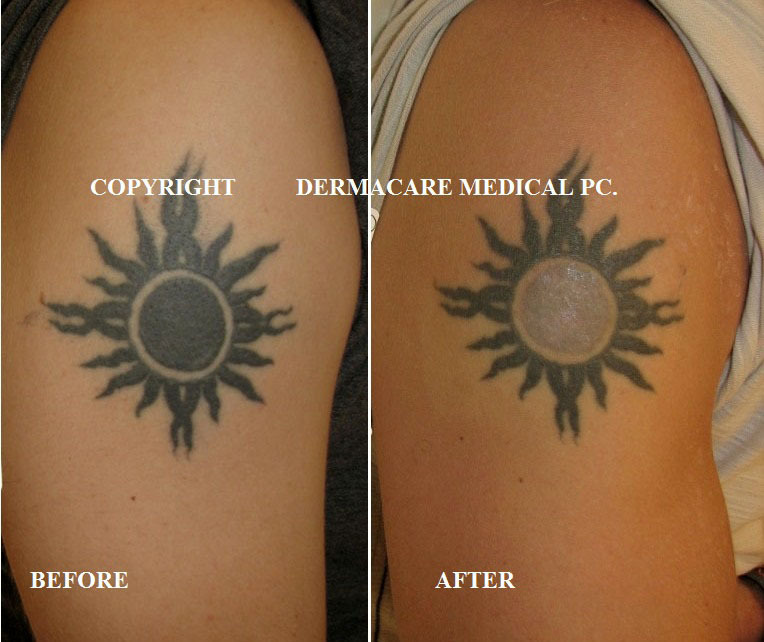 Laser treatment is the only effective method of tattoo removal that is unlikely to cause skin scarring. The alternatives to laser tattoo removal include surgical excision, salabrasion (using salt to burn away layers of skin), and chemical peels (using acid to burn away layers of skin). These methods not only cause scars but are also very painful. Laser treatment with the Palomar Q-YAG 5 is a state –of-the art treatment that yields excellent results without the perils and disadvantages of other procedures. Right after the treatment, there will be a redness of the skin. A minor pin point of bleeding is possible, blistering and oozing may occur. This usually heals within 10-14 days. The tattoo will appear somewhat cloudy and starts its fading process over the next month or so. Most tattoos require multiple treatments to achieve maximal clearing and are usually scheduled every seven to eight weeks apart. Apply ice compresses to the treated areas as often as possible for the first 24 hours. Constant cooling of the treated area has shown to be effective in minimizing blistering. Ice compresses may be continued thereafter if you find they offer relief. Be careful not to overuse ice to avoid frost bite. Remove the dressing after 24 hours and twice daily, wash treated area gently with soap and water, part dry and apply Aquaphor ointment or Vaseline or Petrolatum Jelly To protect the healing tissue, apply the ointment until all areas are completely healed and dry which can take five to fifteen days. Apply a clean non-stick dressing to the area and secure with tape. Over the next several days blisters may form followed by a scab or thin crust. Any scabs or crusting should be allowed to fall on their own. The underlying skin will remain red for a few days to several weeks. TO MINIMIZE COMPLICATIONS DO NOT PICK OR REMOVE DEAD SKIN OR SCABS! You may experience some discomfort after the treatment. Treated areas will sting for about one or two hours after treatment. You may take an Acetaminophen (Tylenol) analgesic, as advised, for pain relief. Stronger medications may be prescribed when needed. Showering/bathing is permitted after 24 hours. Gently pat the area dry; do not rub with a towel or washcloth as this may disrupt the crusting/scabbing process. Do not apply make-up until all treated areas are dry and healed. This usually takes 7 to 10 days. Carefully protect your skin from the sun for the first 2 weeks. Wear a sunscreen (SPF 30 or greater) for 6 weeks after treatment. Avoid swimming, hot tubs and contact sports while crusts are present. If the treatment area shows signs of infection-profound redness, swelling or tenderness, or pus, notify Dr. Yagudin. Treatment intervals are typically six weeks apart. This gives the treated area adequate time to heal. Also, this allows the body time to absorb and discard the tattoo ink through the lymphatic system. Treatment at less than six weeks does not appear to be any more efficacious, however it may create a higher risk for scarring since the treated area may not be adequately healed. The content on this website is provided for informational purposes only, and is not intended in any way to substitute professional medical advice during an in office consultation and examination by the physician. Any photos from this web site with text “Copyright Dermacare Medical PC” on them are not allowed to be copied and reprinted in any way without written permission from Dermacare Medical PC. complImentary consultation with Dr. Yagudin.